A couple mornings ago, I awoke filled with energy. No way was I going to spend the morning, sitting around the house in front of a computer. I grabbed water and my camera gear, and drove to a nearby town. LaBelle is cute. It’s where you catch the road north to Placid Lakes and Orlando. It recently acquired a Walmart, but they built it out of town, so you can easily pretend it doesn’t exist. Labelle is full of quirky shops and small cafes, and it has the feel of “old” Florida, though my guess is that won’t last long. As climate change progresses, making it harder to live on the coasts, people will move inland to towns just like LaBelle. I’d movee there in a minute if I could find an affordable rental. My first stop was on Main Street, where I spotted this brightly painted floral and gift shop. 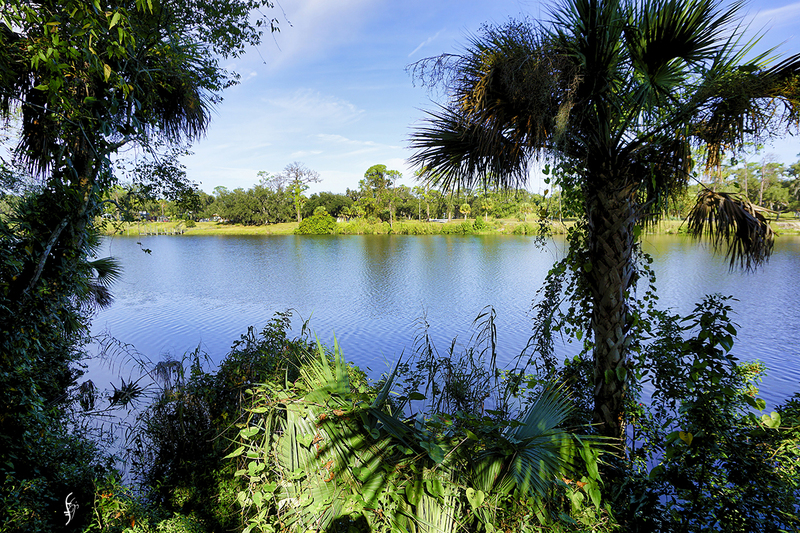 Because I was so close to it, I had to shoot it as a two-photo panorama and stitch the pics together in Photoshop. Click to see detail. In the parking lot to the right, under a gorgeous old tree, was this fellow. Note what’s written on his hat. After I drove around town a while, looking for a coffee shop that, unfortunately, no longer exists, I searched out a small nature center on the river. The walk is short but instructive; there are info signs posted so you can read about local plants and trees. It was quite lovely, actually. Benches are everywhere, so you can sit and enjoy the bird song and buzzing insects. At the far end of the trail (there are several, weaving through the area), which ends at the river, is a pavilion offering a roofed picnic area. I will visit here again. 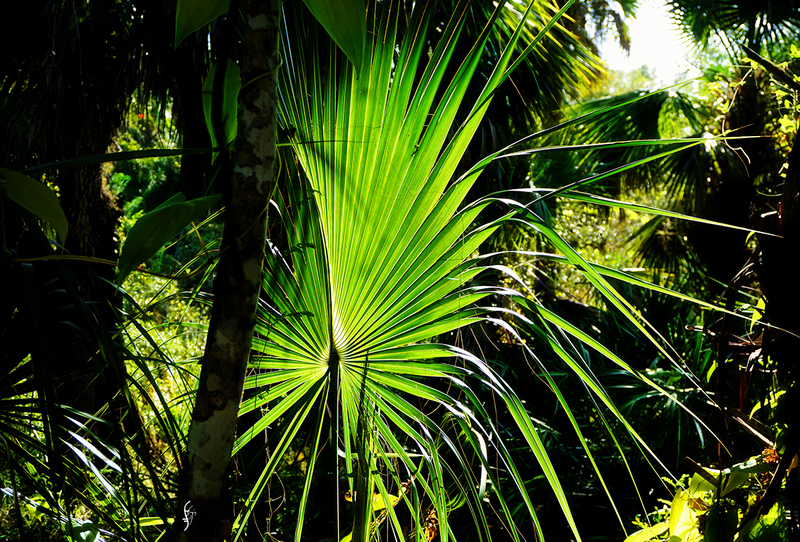 A palm frond glowing with sunlight. Isn’t it gorgeous? Finally, a Before/After. Here is a view of the river. We start with the photo after basic processing in PS. A nice shot. Good sky, good shore, but the foreground light is uneven. I took it into Luminar, used the Accent AI slider to bring more light to the front. Then I added more color to the sky with the new sky enhancing slider. Last, I added a dash of radiance. The differences are subtle, but they improve the picture. That sky enhancing slider is a wonder. It analyzes the photo, identifies where the sky is, including between tree branches, and does a terrific job of adding depth and color. I’m impressed! First time I’ve used it. Sure won’t be the last. 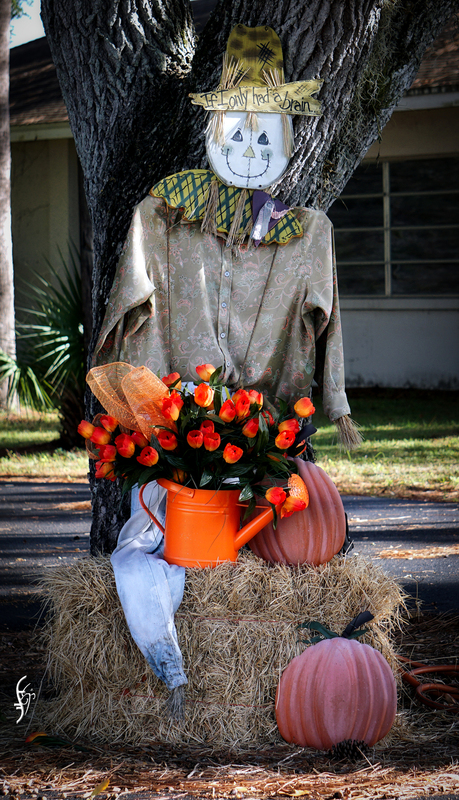 This entry was posted in photography, RL and tagged LaBelle, photography. Bookmark the permalink. I was in LaBelle in 2000 for my dad’s 80th birthday. Nice little town. It is. I wished I lived there. More to do, more to enjoy, than where I currently am. I also like the Lake Placid area. Lots of lakes, for one thing. 🙂 I’ve made it my mission to explore the area and try to find something I can afford. I need a new space to photograph and explore.